Is the life of a stranger worth risking your own life and the lives of your family? As a troubled child raised on the rough side of Baltimore, Joshua Broady thought he’d never need ponder such a question. Yet twice Joshua is forced to determine another’s fate. Joshua Broady enjoys a happy, successful life, loved by his family and celebrated by his peers. But as a young teenager Joshua appeared a certain prison candidate. Fortunately the inspiration found from an unlikely friend altered his path, but not his destiny. Joshua returns to the place that symbolizes a time in his past that has purposely been forgotten. Here he discovers a man on death row, whom he knows is innocent. Risking his own life, and the safety of his family, Joshua entrusts his account of events to a local detective, and through him discovers a community fraught with prejudice and deceit. A conspiracy deeper than anyone could have imagined exposes itself. Only the forces urging him to stay silent match local cop, Billy Hamilton’s desire to see justice. His choices could very well determine if the truth will ever have a voice, if indeed he survives long enough to allow it. Joshua soon finds himself unable to delineate his allies from his foes. All the evidence points to Joshua – but after twenty years lies still remain and Joshua still finds himself behind bars. Not the best of scenarios for a black man in the deep south of white America. I’ve had a life-long love of social justice stories and always gravitated to ones that inspire a change in perception. Characters demonstrating integrity, authenticity and selflessness, that go beyond themselves to do what’s right. Now that’s the kind of stuff that stirs the soul. I love stories like; Mississippi Burning, Amistad, American History X, To Kill a Mockingbird, Dead Poets Society, Scent of a Woman and The Hurricane. I wrote this book over 10 years ago, so the exact thought processes are a bit cloudy. It would have been a mixture of personalities from people I knew and characters I’ve see or read about in books and movies. I have thought a lot about which actors I would choose to play each character in the book. It’s funny the people you come up with who you think will suit that particular character. I can visualise it on the big screen, no doubt about that. Desperate and frightened, a young boy collapses to his knees exhausted. Like the cross with which Jesus was burdened on the way to his crucifixion, Joshua carried what felt to him the luggage for his own demise. Cradled in his arms lay Thomas Lloyd, a young local boy two years his junior. Thomas lay limp, bloody and unconscious, compelling Joshua to painstakingly rise to his feet and endure his torrid journey. He hobbled toward an unknown destiny with one thing certain; the path would not greet him with fairness or compassion. The scorching midday sun bore down on Joshua’s dark skin like a magnifying glass, amplifying Joshua’s plea for mercy from his arduous plight. The harsh summer heat had transformed the feel of the soft grasses around him into an unholy bed of thorns, forging themselves deep into Joshua’s feet with every agonizing step. Life from Joshua’s own body was now quickly fading. Death for him had become almost desirable as his suffering elevated to the extreme of unbearable. Never had he experienced or even fathomed the existence of such contemptuous sensations. The peacefulness of his unconscious passenger was now becoming enviable. An eerie silence surrounded the two boys as though nature held its breath to bear witness to this travesty as it unfolded. The only sound that filtered through Joshua’s consciousness was the faint trickle of water adjacent to him. Normally Norial Creek boasted a generous, flowing stream, five miles south of the main town of Braxton, but this day it merely offered a stagnant dribbling reminder of how much the land thirsted. Dozens of ring-necked ducks collectively cried out for a reprieve, echoing this misery, whilst several blades of grass were met with droplets of fluid. This unexpected deluge was not the innocent offering of sustenance the land desired but instead a reluctant flow of sickly red blood from two boys desperately fighting death. A fight they were both losing with every passing second. The sweat from Joshua’s forehead flooded his eyes, stinging and blurring his vision. He peered down at his injured companion and began to sob onto Tom’s chest. In the midst of all his pain and suffering Joshua pondered how any of this could have happened. Now, seemingly only a breath away from total system failure, Joshua managed to explore his soul to find an inner strength few ever called upon. Somehow he was able to muster enough power, but more so determination, to continue hobbling toward a clearing about fifty feet ahead of him. In the distance, Joshua perceived voices calling out, which caused him to stop and examine their owner’s position and the content of their cries. ‘Thomas, come on. It’s time for lunch. Hurry up, before it gets cold!’ shouted the voice of a concerned mother. This was immediately followed by the louder, deeper voice of the father echoing her request, but with slightly less urgency. Tom’s parents repeated their cries and warned Tom that he’d better not be playing games otherwise there’d be consequences. Tom had a habit of wandering off, much to the frustration of both his parents. But like so many other traits, they tolerated this because it gave their son an avenue of happiness. With each passing second, the intensity and the concern in their voices became more evident. Scared and unsure what to do, Joshua was rendered paralyzed with panic. He carefully knelt onto his bruised and shredded knees, delicately placing Tom to the ground. With meticulous care, Joshua gathered large leaves scattered on the ground nearby to create a cushion upon which he could rest Tom’s head. Joshua painfully resumed standing to evaluate the whereabouts of Tom’s parents. With a youthful hesitation in his voice, Joshua shouted out to summon their attention. ‘Over here, he’s over here,’ he beckoned. Through the sparse, dry bushes Joshua observed Tom’s parents’ eager response as they quickly made their way toward him. With Tom’s whereabouts now revealed, a terrified Joshua proceeded to escape into the bushes in the opposite direction, as fast as his weary legs could carry him. His steps were erratic and his lungs gasping, but somehow, either through fear or guilt, Joshua managed to keep moving. He knew the disclosure of Tom’s fate would light a fuse that would lead to an explosion. All he wanted now was to be as far away from there as possible. But the distance he managed to attain was still not great enough to eradicate the devastating cries of a mother and father’s tragic discovery bellowing from behind him. Like an involuntary catalyst it propelled Joshua forward to accelerate his escape. I was born in Albury, NSW and have lived in Sydney for the last 24 years. I am one of seven children and have a twin sister. Growing up I discovered I had a creative flare, especially with drawing and painting. I loved creative writing, reading books and watching movies. I’ve always gravitated toward stories and inspire the soul and challenge perceptions. I derive inspiration from characters that demonstrate integrity, authenticity and selflessness, that go beyond themselves to do what’s right (i.e. Atticus Finch, Aragorn, John Keating-Dead Poets Society, Luke Skywalker etc.). After leaving school, my studies were very science based (Physiotherapy), as I also had a keen interest in anatomy, fitness, injury and healing. After working for many years in an Orthopaedic ward, assisting the healing of broken people (literally), the creative side in me was ready to burst. 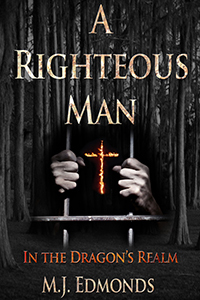 I wrote A Righteous Man in 2002 and another, yet to be released book after that. Both sat on the shelf dormant until now. In fact, my wife secretly accessed copies of both books from my computer and printed them out as bound hard copies, to give me them as a gift for our first wedding anniversary. This instigated a renewed zest for them both and hence the current publication on Amazon. I have worked and travelled extensively in the USA over the years, mainly due to the fact my brother has lived there for over 20 years. I’ve seen more of the USA and Canada than I have of Australia, which was obviously helpful when writing this book as it is set in the deep south of America. My other creative outlet over the years has been spending countless hours learning graphic design and 3D animation software programs such as Photoshop, Maya, ZBrush and After Effects. A big challenge initially, for someone only competent using Word and PowerPoint. They are big programs, so I think mastering them will be a long-term endeavor, but I’m getting there slowly. Although I’m currently taking 1 year off my normal day job to look after my baby daughter while my wife builds a business…I can honestly say I’ve never been so tired. I love my daughter dearly. She is such a joy and I treasure this time I can spend with her and watch her grow. But I also take my hat off to all mothers out there who look after multiple children, especially single parents. I miss a good sleep and when I do manage to get a rare uninterrupted sleep, my brain only seems to reverberate Wiggles songs. I hope people enjoy reading my book as much as I enjoyed writing it. Amongst the dark traits, attitudes and behaviors of some of the characters, there a sense of hope, courage and integrity that represents the underlying message of this book.